Teenagers. They all have to go through the frustrations of growing up. Coal seems to be having a more difficult time than most. Poor Loki. Loki is definitely not looking forward to his boys reaching this age, hahah. And his boys PROBABLY won’t be as much trouble. I love this comic! I love how upbeat Hedda is now that she knows she isn’t a slave anymore. This comic is so funny, sad, intense at some points and enlightening. As for learning more about Norway and Scandinavia, I’d have to say Wikipedia is actually a good place to start. I’d never use it as a sole source, but it’s a great place to get your feet wet. Most articles include further reading at the bottom of the page that are actual books you can probably read. That lighting looks amazing btw. Thank you! It’s fun to play with that whenever the location changes. A meal fit for a god, apparently. Normal loki eyes look awesome! 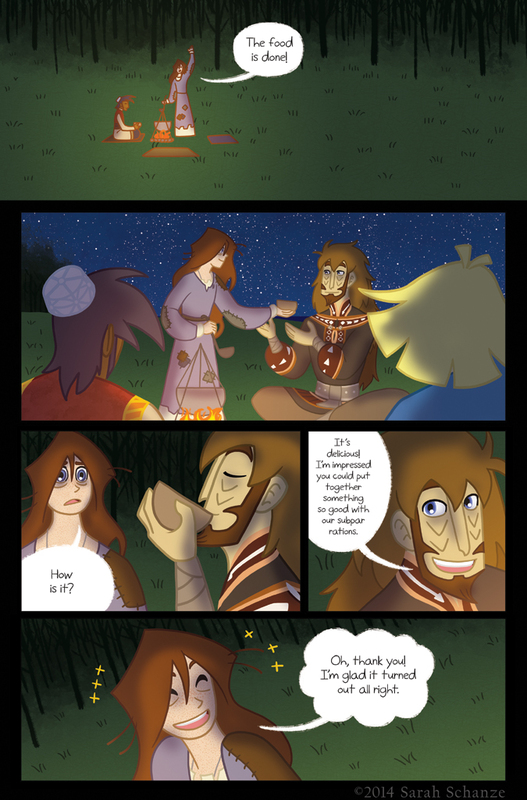 I love this comic and your attention to detail concerning norse mythology is amazing! keep doing what your doing . I’m going to be selling at Pittsburgh ComiCon at the end of next month myself. Good luck with the small press expo. Thanks! This will only be my second con, but the first was a lot of fun, so I’m excited! I mean, “Durr! Why learning to read? Hedda doesn’t need it! Hurr durr!!”. Seriously? It’s like telling her she’s too dumb to need that. That bratty semi-sentient uncultured blondie kid needs some real parenting. Yes, I go mad when people say culture and education are useless. These are the very freaking things that make us interesting and different from animals, for Flying Spaghetti Monster’s Sake. It gives us the ability to read, to pass down tremendous amounts of knowledge, to rise above the caveman-like level of economy. There. Rant is over. Sorry for the disturbance. Haha! I’m sure you’re not the only one who wouldn’t mind seeing Coal get knocked around. I can even see Coal in the background being grumpy and wearing an apron, completely unrelated to his grumpiness, mind you, and Loki with that chef tophat being his charismatic and sly self.